Chances are, you have a few too many old electronics laying around. Maybe your closet floor is cluttered with cords or you just haven’t figured out what to do with that old desktop which got a new job as a doorstopper a few months back. That’s okay – it’s much better for the environment to keep them in your closet rather than in a landfill. If you’re unsure about electronics recycling in San Jose, these red flags will let you know that now’s the time. First of all, kudos to you for holding onto your old electronics rather than tossing them in the trash. 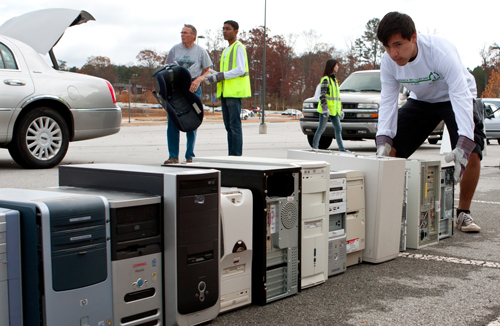 Seriously: e-waste is creating a global health crisis. It’s crucial to take your old computers, monitors, cables, and all equipment to a dedicated facility for electronics recycling in San Jose. A lot of the responsibility falls on the consumer to dispose of their e-waste properly and do their research on recycling facilities. The good news is that this gets easier to do every day. Although dropping off your electronic waste is getting easier, it still involves gathering your old belongings and leaving the house. Here’s how to tell that now’s the time for a visit to a facility that specializes in e-waste recycling in San Jose. You can’t see your closet floor through all the monitor, ethernet, and USB cables. You haven’t used your old laptop in so long that your cat has claimed it as her new bed. You’re moving to a smaller place (or just moving in general). Your dad has asked about turning your old desktop into a birdhouse. Your junk drawer is filled with nothing but old phones and electronics. You’re about to buy a new phone or upgrade your laptop. You can’t remember the last time you used that tablet (or where it is). Your desktop is filled with dust which you haven’t bothered to clean since you never use it. Your tablet gets more use as a paperweight. If it looks like now’s the time to get rid of your old electronics, Green Ewaste Recycling in San Jose can help. From laptops to computer components and monitors, we take nearly everything in any condition and we service the entire South Bay Area with over ten years of experience. Also, you can rest assured when recycling your old electronics because our data removal process meets standards set by the U.S. Department of Defense. Contact us today with any questions about our data security procedure or how we can help. Come in and see us: drop-offs are always free.